In 1733, the parish of Offcote and Underwood set up a workhouse in a row of four cottages originally used to house the elderly. In 1753, a workhouse was opened at Tissington. A parliamentary report of 1777 recorded local workhouses in operation at Ashbourne (for up to 60 inmates) and Bonsall (40 inmates). Prior to 1834, the local workhouse in Ashbourne stood on the west side of Dig Street. There were also workhouses at Brassington, and at Alstonefield which joined the Ashbourne Union in 1869. 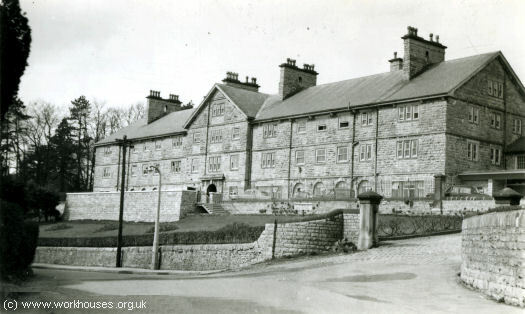 Brassington's parish workhouse stood on The Street. 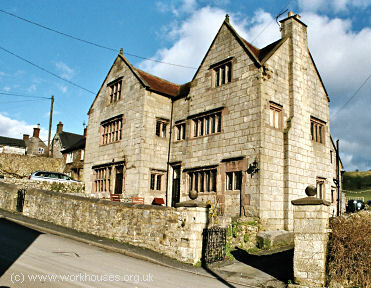 The building, which dated from 1615, was known as Tudor House. Brassington former parish workhouse, 2005. In 1820, Brassington and five other parishes formed a Gilbert Union, sharing the workhouse at Brassington. There were eventually more than twenty parishes in the Union, which was dissolved by the Poor Law Commissioners in 1837. Derbyshire: Alkmonton, Ashbourne (2), Atlow, Ballidon, Bentley Fenney, Bentley Hungry, Biggin, Bonsall, Bradbourne, Bradley, Brailsford, Brassington, Callow, Carsington, Clifton and Compton, Eaton and Alsop, Edlaston and Wyaston, Hartington Town Quarter, Hognaston, Hollington, Hopton, Hulland, Hulland Ward, Hulland Ward Intacks, Ible, Kirk Ireton, Kniveton, Lea Hall, Longford, Mappleton, Mercaston, Middleton by Wirksworth, Newton Grange, Offcote and Underwood, Osmaston, Parwich, Rodsley, Shirley, Snelston, Sturston, Stydd, Thorpe, Tissington, Waterfall, Yeaveley, Yeldersley. Staffordshire: Blore with Swinescoe, Calton in Blore, Calton in Mayfield, Calton in Waterfall, Calwich, Ellastone, Ilam, Mayfield, Okeover, Prestwood, Ramshorn, Stanton, Woodhouses, Wootton. Later Additions: Alstonfield (1869), Hopton and Griffe Grange (1858), Musden grange (1858), Wetton (1869). The population falling within the Union at the 1841 census had been 20,658 — ranging from Lea Hall (population 22) to Ashbourne itself (2,158). The average annual poor-rate expenditure for the period 1842-44 had been £5,567 or 5s.5d. per head of the population. The delay in forming the Ashbourne Union seems to have been due in part to claims by a number of parishes in the area that they belonged to the Alstonefield Gilbert Union. (Gilbert Unions were exempt from most of the provisions of the 1834 Act.) Resistance by local magistrates who lost their old-established poor-law powers under the Act may also have contributed. Before the building of a Union workhouse in 1848, the Ashbourne Board of Guardians met fortnightly at the Green Man inn (and were apparently reluctant to switch to the new venue!). During this period, use continued to be made of the old workhouse at Brassington which could accommodate 130 inmates. Around ten sites were considered for the new workhouse. The one eventually chosen was on Dark Lane (later Union Street, then Belle Vue Road) in Ashbourne, overlooking the parish church. The land had been purchased for £800 from a Mr Dale. The architect for the new building was Henry J Stevens of Derby who was best known for designing churches and mansion houses. The Guardians' formed a building sub-committee which visited the workhouses at Derby, Chesterfield, Bakewell and Nottingham. The building contract was awarded to the firm of Hobson and Mowbray of Leicester who had submitted the lowest tender. However, a variety of problems led to the break-up of the partnership and the building being incomplete. Local builder William Evans of Ellastone took over the work and the main building was completed in 1848. However, vagrants' wards and other buildings were not completed until 1855 by which time the total cost had escalated to £8,000. The workhouse could accommodate up to 160 inmates. Its location and layout of the workhouse can be seen on the 1920 map below. The main workhouse building was a T-shaped three storey building, faced with local limestone. The central portion contained an entrance hall, porter's rooms, and the master and matron's quarters. Accommodation for male inmates was in the west wing, and for women in the east. Basement rooms included probation wards, work rooms, and play rooms for the children. By 1850, a schoolmistress was also in residence. Ashbourne main building from the east, date unknown. 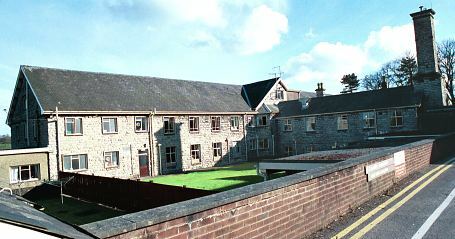 Ashbourne main building from the east, 2001. The central rear wing probably contained the dining hall which would also have been used as a chapel. 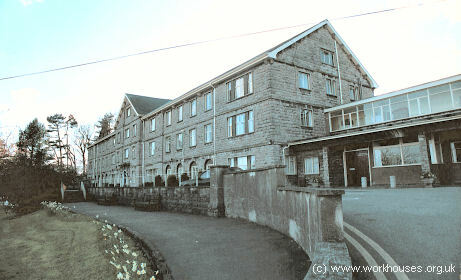 Ashbourne main block from the north, 2001. In order to move them "off the poor rates" children from the workhouse were often apprenticed to a trade. For example, in January 1852, Richard Henchley, proprietor of a boarding-school on Church Street, agreed to take Mary Parker as an apprentice for £2 a year as long as the Board paid for her clothing. In reality, Mary Parker was probably just used as a domestic servant. A schoolmistress resided in the workhouse. Books ordered for the workhouse classroom in 1849 included Lessons in Geography, Mother's First Catechism, Instruction in Household Matters, An Agricultural Class Book, and histories of England. In 1850, a proposal to employ a school-master was dropped due to the small number of boys present in the workhouse. Instead, the porter took on their instruction in a room next to the porter's lodge in breaks between his other duties. By 1925, the children had been moved out to cottage homes on Mayfield Road and attended the Public Elementary School. Able-bodied inmates in the workhouse performed stone-breaking, while the elderly were employed in picking oakum. On November 5th, 1861, Samuel Walker, the 53-year-old master of the workhouse, read prayers as usual to the male adult inmates. He was then not seen until about half-past nine when the porter found him hanging by the neck from a beam in the chapel. He summoned one of the female inmates who assisted in cutting down the body which was warm but quite dead. An inquest later that day returned the verdict that the deceased hanged himself whilst labouring under temporary derangement. The workhouse later became Ashbourne Public Assistance Institution or just "the Institution". Under the National Health Service it became St Oswald's Hospital. In the early 1900s, the union set up children's 'cottage home' in two terraced houses at 58-60 Mayfield Road, Ashbourne. The home could accommodate up to 16 children. Derbyshire Record Office, New Street, Matlock, Derbyshire. Few records survive — holdings include: Guardians' minute books (1845-1930); Register of boarded-out children (1908-34); etc. Early Victorian Country Town; A Portrait of Ashbourne in the Mid 19th century edited by Adrian Henstock (1978).